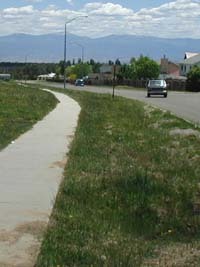 In the photo at right, there is no buffer between the sidewalk and the street. This sidewalk is five feet in width, and there is a potential hazard if a pedestrian accidentally steps out into the street. 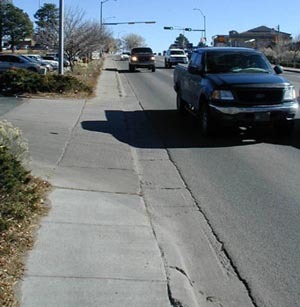 The hazard would be worse with a four-foot sidewalk, which is typical of residential areas. The major problem with this "no buffer" condition is that it makes walking unpleasant. The pedestrian's visual field is filled with the street, and there is more exposure to noise and exhaust fumes from vehicle traffic. 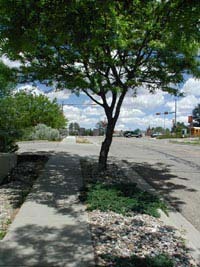 In these photos, there is a buffer between the sidewalk and the street. Even where there is no landscaping, as in the lefthand photo, the buffer makes pedestrians feel safer, and somewhat insulates them from noise and pollution. In the photo on the right, we see a buffer that dramatically improves the aesthetics of the street. Well-planned buffers, such as the one on the right, also serve as a "traffic calming" measure. By narrowing the driver's field of vision, a buffer of trees reduces average speed on the road. It makes both walking and driving more pleasant, and increases property values in the neighborhood.